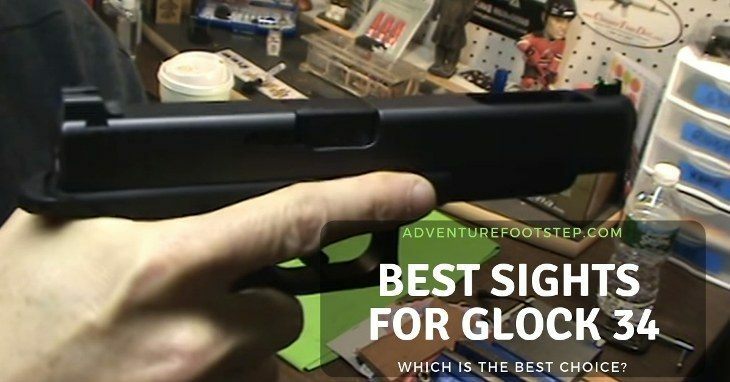 Top 3 Best Sights for Glock 34 Reviews 2019 - Which is The Best Choice? →Top 3 Best Sights for Glock 34 – Which is The Best Choice? Top 3 Best Sights for Glock 34 – Which is The Best Choice? The Glock 34 is famous for shooting competitions and tactical operations. But having a compact and lightweight handgun is not enough, particularly at night. So, what you need at this time is the best sights for Glock 34 to help you aim the targets more easily with greater speed. Come with us to know instantly! What is Your Final Choice, After All? Most of the sights use tritium, a radioactive isotope of hydrogen. Although it’s radioactive, it has no threat at all since the tritium gas is encapsulated in a non-hydrogen permeable container. Besides, there is an updated version in this market; which makes use of a fiber optic tube in sight. This material is helpful since it glows brightly, even in dim light. And the glow is completely focused with no magnification. So, you can view your targets clearly. However, in terms of the durability, the tritium sights last longer than the fiber optics due to their chemical composition. Aside from the composition inside the tubing, you need to notice the material of the housing. It’s best to choose the metal like steel or aluminum for the Glock sights because they are lightweight and can take a beating from constant recoils. Also, avoid the plastic housing since it easily breaks. The front sight of Glock 34 sight often comes with a large dot to help you concentrate on the front, not the rear. And most front sights in profile follow a normal semi-ramp style. Since the blade faces away from the shooter, this design will lessen snag when holstering the firearm. Regarding the widths of the sight, you can find numerous variables for the front area. Depending on the width, it will influence the accuracy and speed of the Glock. For instance, if the front sight is wide, the accuracy will be less, particularly for shots at a longer distance. In our opinion, you should opt for a width of 0.125 inches to get a right speed and accuracy. All the rear sights feature two dots placed side by side. They can be either painted or made of tritium, giving a better focus on the front sight. And when both front and rear sights are accurately aligned, it offers a proper shot. As mentioned above, buying a Glock sight allows you to see targets clearly at night. But the best choice is that this sight functions well both daytime and nighttime. In case the night is your priority, make sure you can receive fast target acquisition from it. The two-dot sight features a large dot at the front area and a smaller one at the rear. That’s why the front sight is brighter; meanwhile, the rear sight concentrates on offering a soft glow to highlight the central dot. The three-dot sight is on most Glock series, with one at the front and two at the rear. These sights can be either made by fiber optic or tritium or a combination of both. 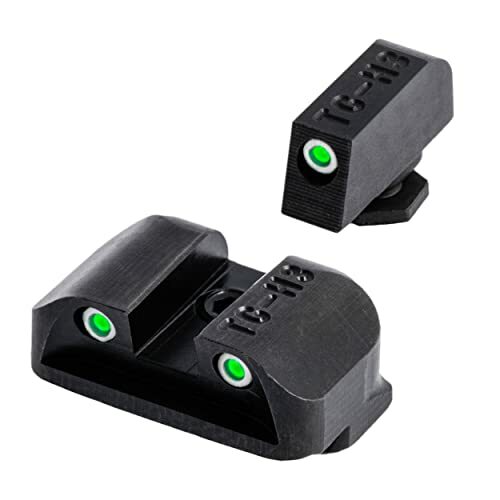 The I-dot sight comes with a large dot on the front sight while the rear sight includes a line painted under the notch. The u-shaped rear sight is commonly used by those interested in target competitions. This type allows you to aim at long distances with ease. Firstly, you need to take apart your Glock 34 and get the slide without affecting the recoil spring or the barrel. Then use the nut driver to remove the front sight. Place the new sight in the right direction and apply a bit of the medium strength threadlocker on the new screw. Make sure you follow the instructions properly as this step is important. When facing the back of the slide, it’s best to remove the sight from left to right. And when installing it, it should be right to left. The next step is to hold and screw the front sight. But note that twisting can mar it unnecessarily. So, you have to find out whether or not you put it accurately. Put the nylon jaws in your vice and set the slide. Then use the hammer and nylon punch to remove the old sight. Bring out the new sight and avoid dropping it in the center. Next, hammer it by availing the nylon punch until it enters and appears close to the middle. Do the last check with a micrometer or your eyes. If everything is okay, your Glock is ready to use. By the way, If you are finding red dot sight for ar-15, you should find in this post! 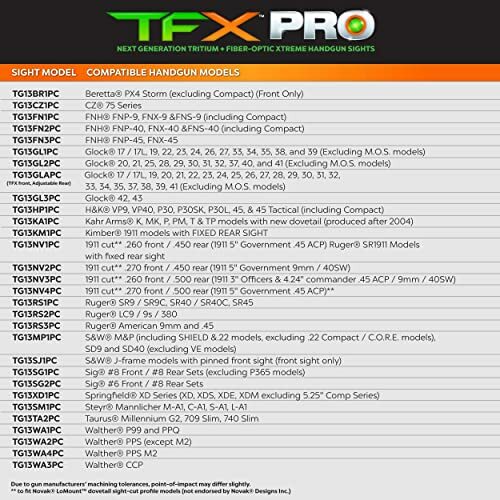 As its name suggests, TRUGLO TFX Pro is made of fiber optics and tritium as light sources. That’s why this sight will guarantee you an endless glow all day and night. The front sight has a bright red circle around to provide you quick and precise target acquisition. Meanwhile, the rear sight with two green dots supports the visibility and improves focus to the front sight. When it comes to durability, this product boasts its toughness against any damages because it’s entirely made of steel. Also, it’s known to be virtually indestructible from chemical, oil, rust, harsh cleaning solvents, and so on. Well, the TRUGLO TFX Pro works well for competition shootings since it’s simple to use and aim the target. Although it is bigger than usual Glock sights, it still fits standard holsters perfectly. 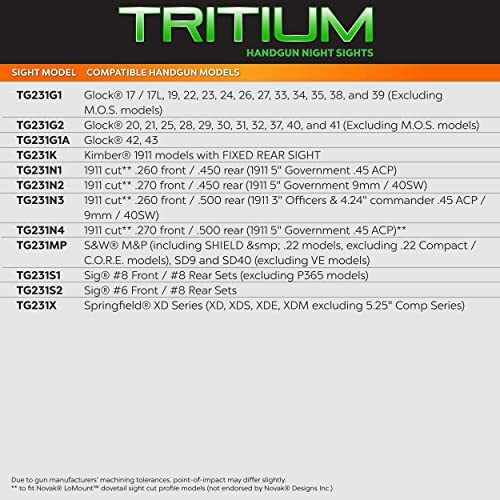 As compared to the TRUGLO TFX Pro, TRUGLO Tritium Handgun comes with an affordable price. If you have a tight budget yet love this brand, you can consider this product. What makes this sight ideal for your Glock 34? Instead of using both tritium and fiber optics, it’s only made of tritium. But don’t worry since this material delivers the necessary visibility in the dark. Besides, it includes green front and rear lights, supporting low- or no-light conditions. However, when in use at daytime, its lightning is described as moderate. The TRUGLO Tritium Handgun is made of sturdy, CNC-machined steel with a high finish coating for maximum durability, reliability, and protection. It even comes with a snag-resistant design. Another BIG note that you should remember if buying this sight is about installing and removing the sight. Make sure you get proper tools to do, or unexpected problems might happen. The last Glock 34 sight in our list is from Trijicon, a fine combat iron sight marker in the world. 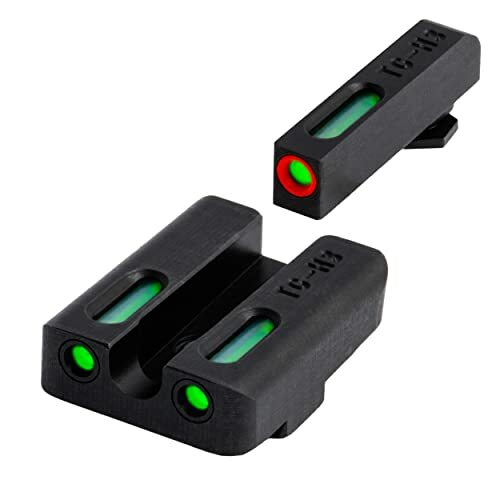 And here is Trijicon HD night sight sets that you should never miss in tactical operations. Its front sight has a big dot tritium lamp. And depending on your taste, you can select between the yellow or orange front outline. With a glow-in-dark photoluminescent powder in the front sight, you will get the faster target acquisition and higher visibility, especially at night. Additionally, the tritium lamps are enclosed in glass lamps and well-protected by cylinders from recoils and abrasions. The rear sight comes with a U-notch design and houses two dots with black colored rings. Relying on that, you can see the front sight and target better. Made out of steel, the Trijicon HD night sight guarantees not only the durability but also portability. Wonderfully, with a limited lifetime warranty, you can always get the glowing sight for years. Although the Glock 34 is known as an all-around excellent firearm, you need to consider adding custom sights to enhance its accuracy. With 3 best sights for Glock 34 above, you can choose the one that fits your demands most. But in case you need a WINNER, we highly recommend the TRUGLO TFX Pro. This sight is designed for not only daytime use but also nighttime. Both front and rear sights also support fast target acquisition and enhance focus when shooting. If compared to other Glock sights, you are guaranteed to get a stronger and more dependable product with this one. Simply make your decision and ORDER NOW to enhance your pistol! Or you can contact us to ask any question you have. We’re always willing to help you.